It begins with a harp. That uniquely dry resonance that remains uncommon in jazz and improvised music. Yes, I know, there’s probably a list of jazz harpists on Wikipedia, from Dorothy Ashby to Alice Coltrane, Zeena Parkins to Clare Cooper, and so on… But, arguably, Finland’s Iro Haarla has shown the longest-standing devotion, placing the harp alongside the piano at the heart of her compositions since her 80s works with Edward Vesala. 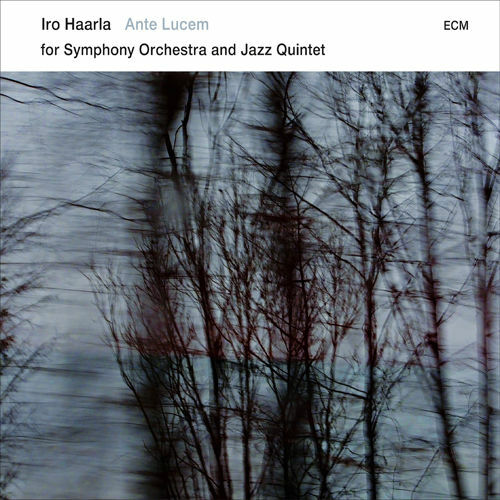 This disc features a suite of four pieces, composed by Haarla, together emblematic of the daily and seasonal struggle between light and dark (literal and metaphorical/spiritual). The listener is left in no doubt that the light will triumph – a welcome message, perhaps, in these turbulent and uncertain times, no? The arrangements are perfectly balanced: from sweeping drama to deep introspection, embracing the power of the large ensemble yet featuring moments of space and sparseness that do much to punctuate the proceedings, giving it air, and evoking the empty beauty of a Finnish winter landscape. It’s during these quieter passages that the jazz quintet shines through – pianistic flourishes, Powell’s pure tone, Seim’s unburnished warmth, the subtle insistence of Krokfors and Kallio’s engine – with brief periods of free-er playing that seem to occur more often the closer the dawn (and spring) approaches (notably the extended middle section of Ante Lucem: Before Dawn in which the quintet ‘breaks free’ for a few minutes; interesting symbolism. This may be Haarla’s quintet, and feature some of the biggest names in Scandinavian jazz (cue the overused label, “Nordic Cool”) but it’s not overly jazz-y. Simply put, orchestral performances sound, well, ‘orchestral’ and this is an elegiac, mood-filled classical suite, with jazz flourishes and embellishments. Don’t expect too hard bop blowing or improvisation, just allow yourself to be carried away by its particular cinematic grandeur (especially the opener Songbird Chapel which has a delicious bittersweet melancholy).